Here's the deal: You might think it's a cakewalk, but building and tinkering with gaming PCs is intimidating to a lot of gamers. 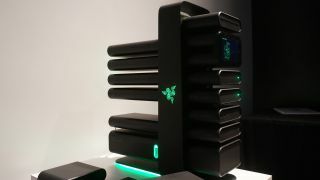 Razer wants to solve that problem much like Valve does with its Steam Machines, but in a different way: a 100% modular gaming PC. Razer calls this Project Christine, and it has me pining for the future of PC gaming after seeing it in the plastic and metal – though just a mockup – during CES 2014. Christine envisions a future gaming PC in which all of its components are modular, meaning they're easily installed, moved around and removed. Want to upgrade your graphics card? It's now as simple as buying one, removing the old hat GPU and popping in the new one. On each component of Razer's concept gaming PC, the only part that's exposed is the connector – Christine runs on PCIe for easy syncing between components. Speaking of which, Razer foresees each of its components being individually liquid-cooled and sporting noise-cancelation for worry-free overclocking. I can't imagine this being very affordable, which would defeat the point of creating more PC gamers. Christine is a brilliant idea, and something I would get behind in a heartbeat, if only it were real. There would be a lot of hurdles for Razer. Namely, the success of Christine would depend on the compliance of component vendors, unless Razer suddenly wants to enter the silicon business. Hopefully, for Razer's and our own sakes, folks like Nvidia, AMD and Intel (and many, many more) are dreaming about it too.